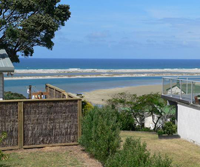 Over the last six years or so Mangawhai Heads and Mangawhai (the latter also known as Mangawhai Village) has experienced a speculative boom in new subdivision activity. Speculative in the sense that much of the demand for the new sections came from investors rather than people wanting to buy them to build holiday homes. When we added up all the vacant sections in the 18 new and newish subdivisions we inspected during our most recent fact finding visit we came up with a total of around 450, which was enough to facilitate around a 26% increase in the total housing stock (i.e. truckloads). But property and sections sales have now tumbled and a new demand-supply reality has descended on Mangawhai, as is the case in many coastal and resort markets. Higher interest rates and high fuel costs will explain some of the tumble in demand, but the main story is about speculative excesses coming home to roost. Developers and investors trying to exit the market are now left competing for a mere trickle of demand from genuine buyers, while the most important question is, â€œWho will be the weakest link?â€ Some developers and investors are already trying to tempt buyers with significant discounts, but it is early days in the new demand-supply reality. It was always a fallacy that coastal section prices would not fall and Mangawhai is in the early stages of making a mockery of this fallacy. How much could section prices fall? The extreme cases so far include one developer offering 25% discounts on five tail end sections, while two sections in a cleverly-marketed subdivision are on offer at 42% below the registered valuations. But in general buyers are not being enticed by the discounts. This gives an idea of how much prices will ultimately fall, especially in the would-be prime subdivisions that donâ€™t cut the mustard when reality replaces marketing hype and greed. * Rodney Dickens is the Managing Director and Chief Research Officer for Strategic Risk Analysis (SRA), which is a boutique economic, industry and property research company. Rodney produces regular free reports on topical issues and on specific property markets. Find out more about SRA here and sign up to SRAâ€™s free reports here.